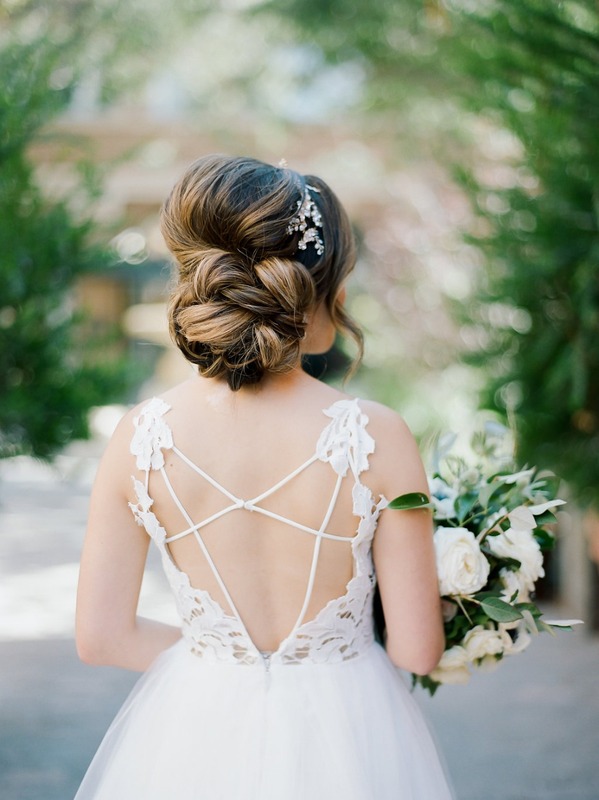 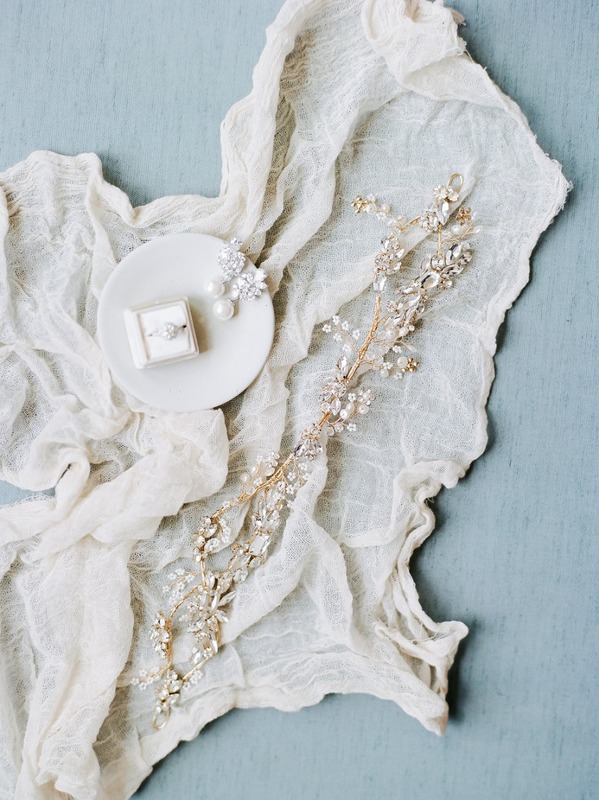 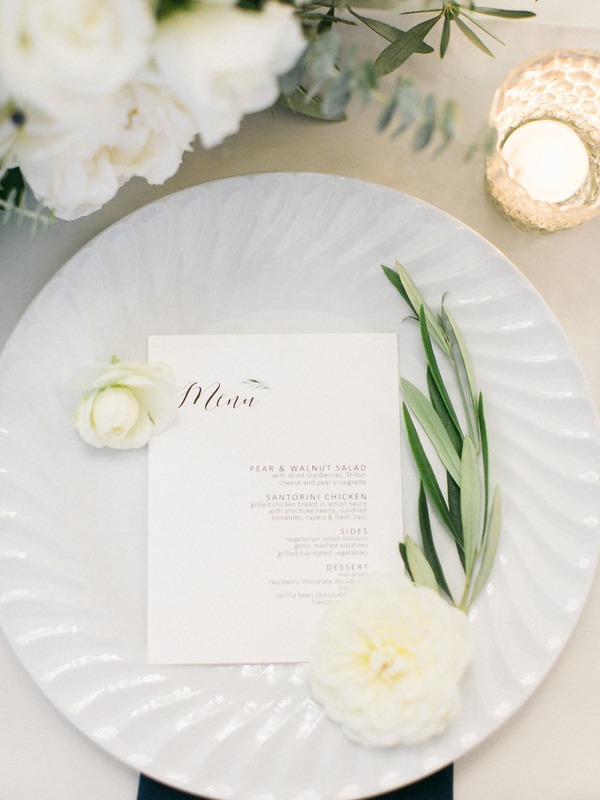 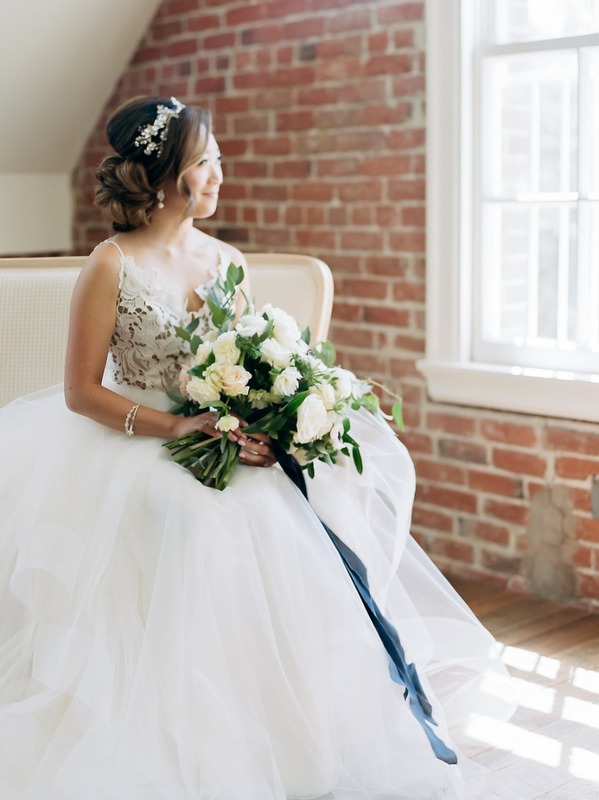 The elegant style of Lisa and Jeremy’s gorgeous wedding day is undeniable. 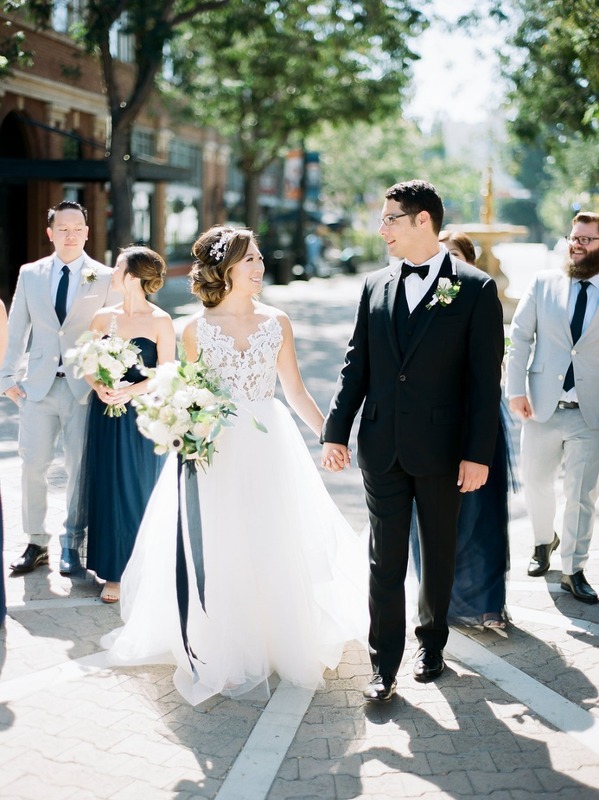 The Estate on Second in the heart of downtown Santa Ana was the dramatic backdrop for their big day and beautifully complemented the chic decor with it’s historic industrial vibe. 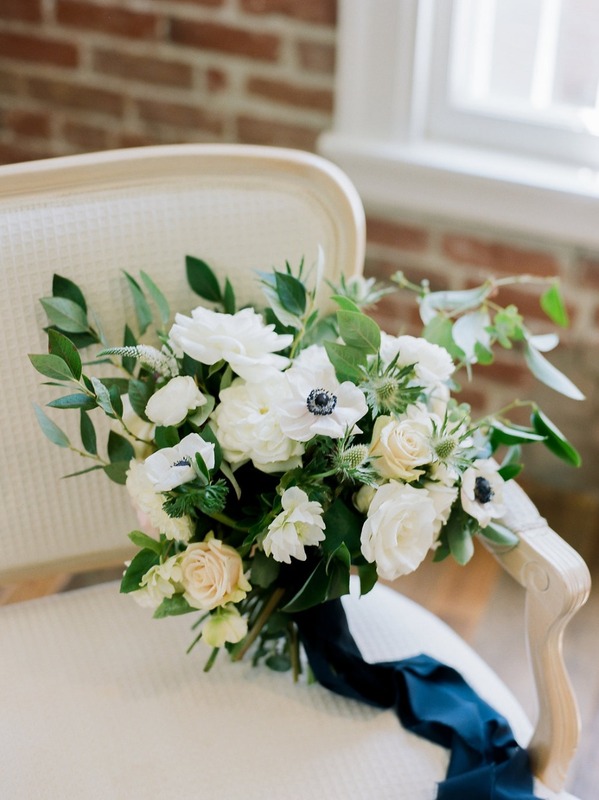 Pops on navy blue and white roses add a classic feel throughout. 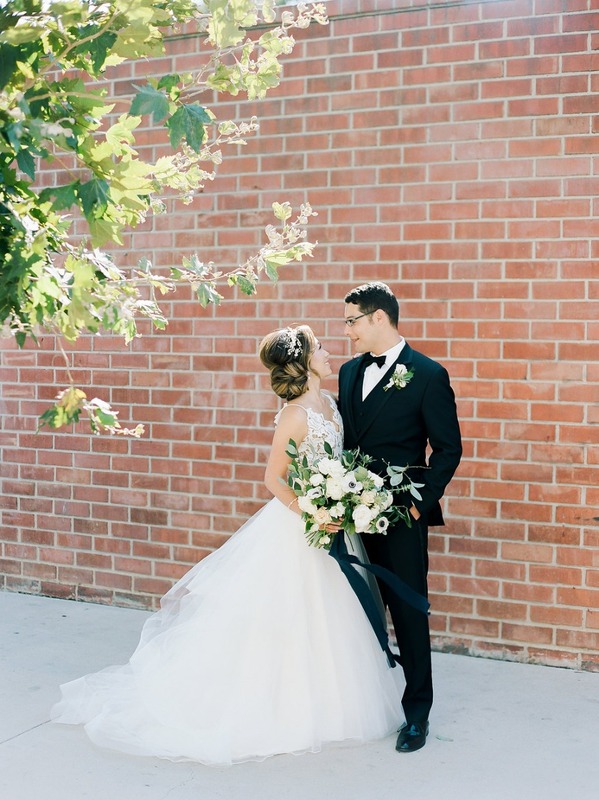 But most of all, the bride stole the show with her jaw-dropping Hayley Paige gown and sparkly Badgley Mischka’s. 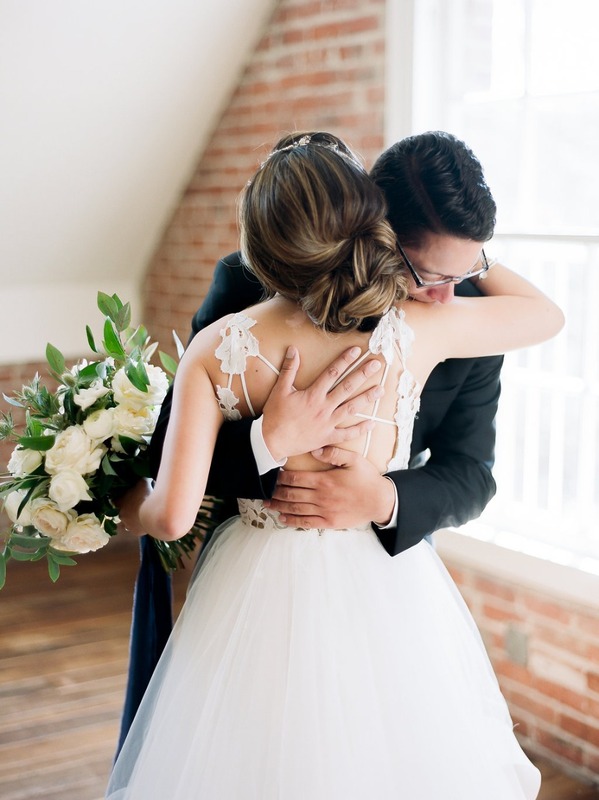 Bridal style #goals right there! 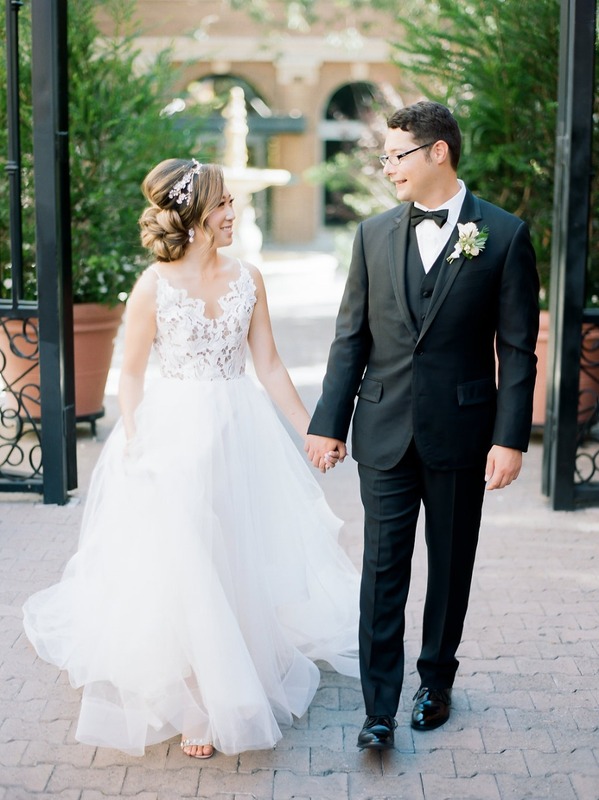 Read on about this elegant wedding below, and find more pin-worthy moments captured by Steve Torres in the full gallery. 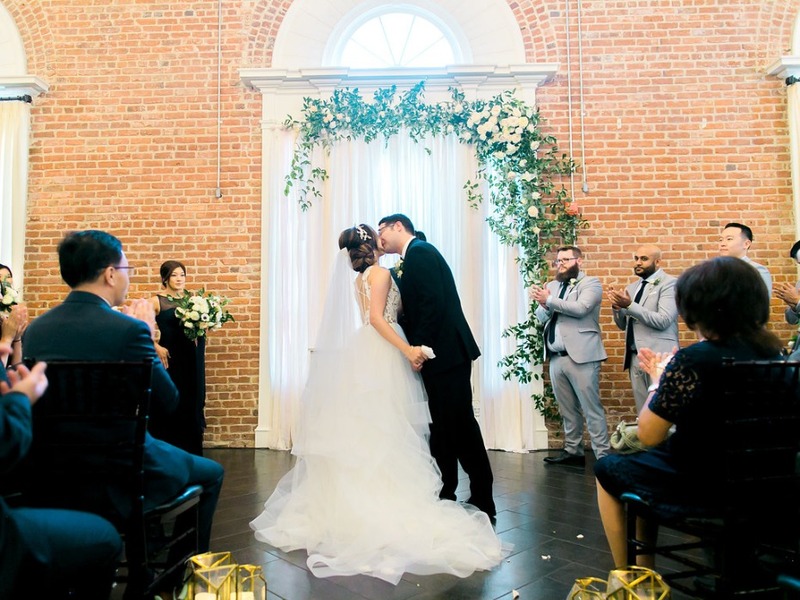 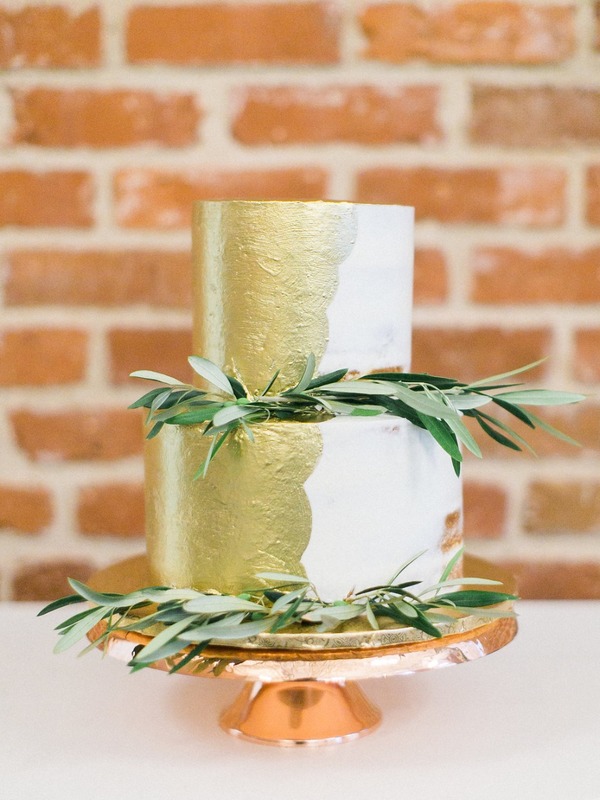 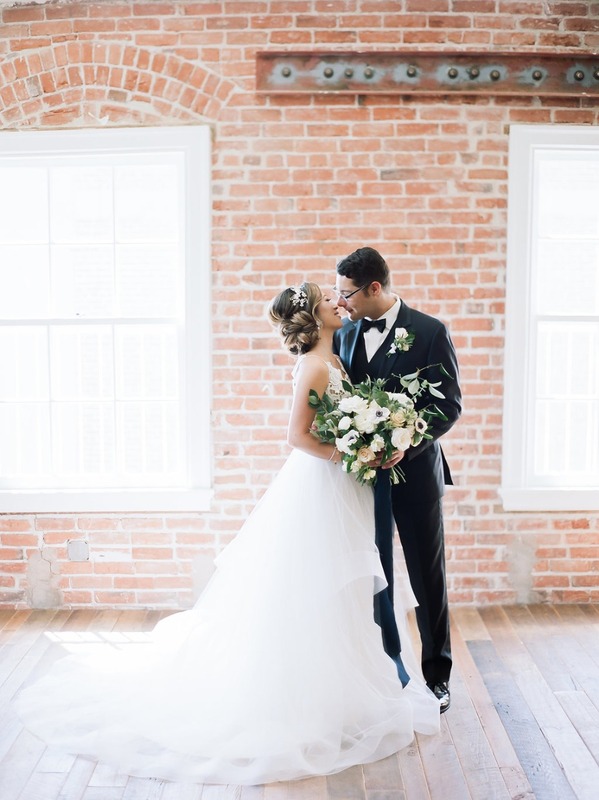 From the planner, Natalie Choi Events: Set in the heart of downtown Santa Ana, Lisa and Jeremy wed at the Estate on Second in a celebration that was classic and elegant. 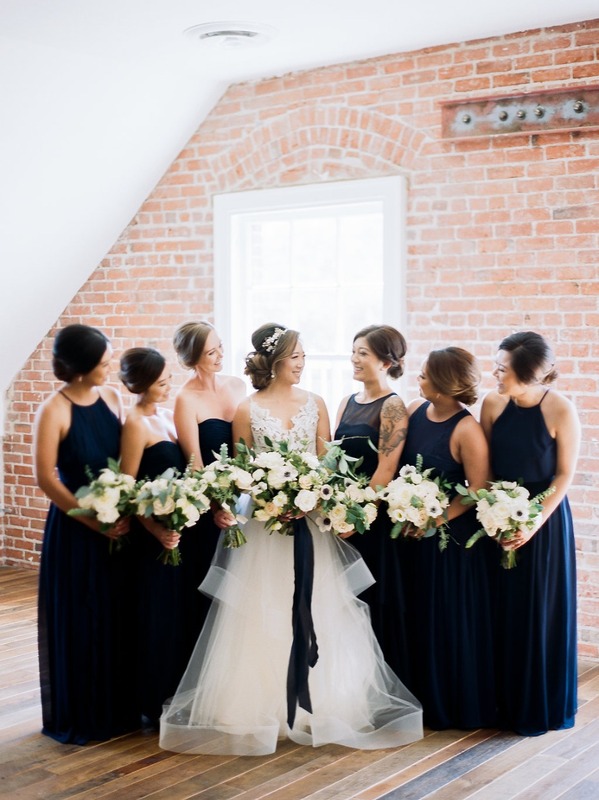 They paired a timeless, natural color palette with navy blue accents, which perfectly reflected Lisa and Jeremy’s elegant style and their historic venue. 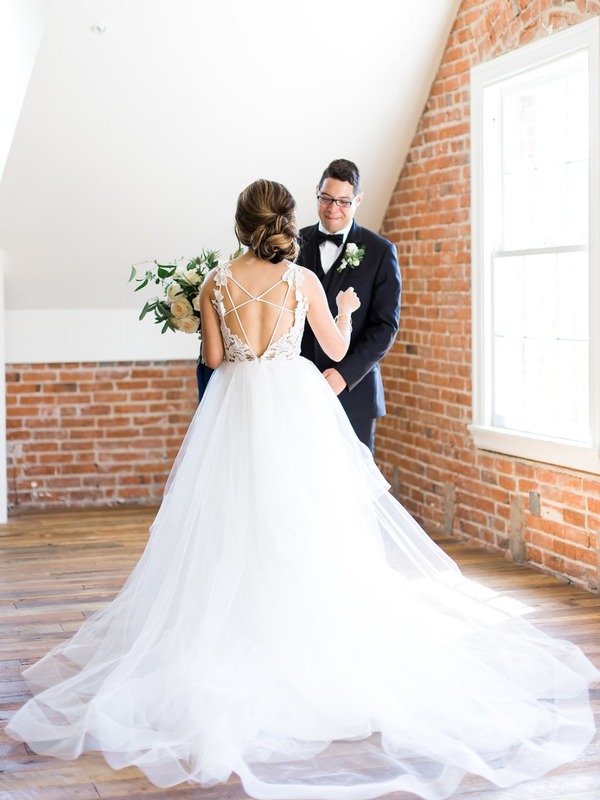 Their emotional wedding day began with both of them in happy tears – first as they read the letters they had written for each other, and then as Jeremy saw Lisa for the first time in her wedding gown. 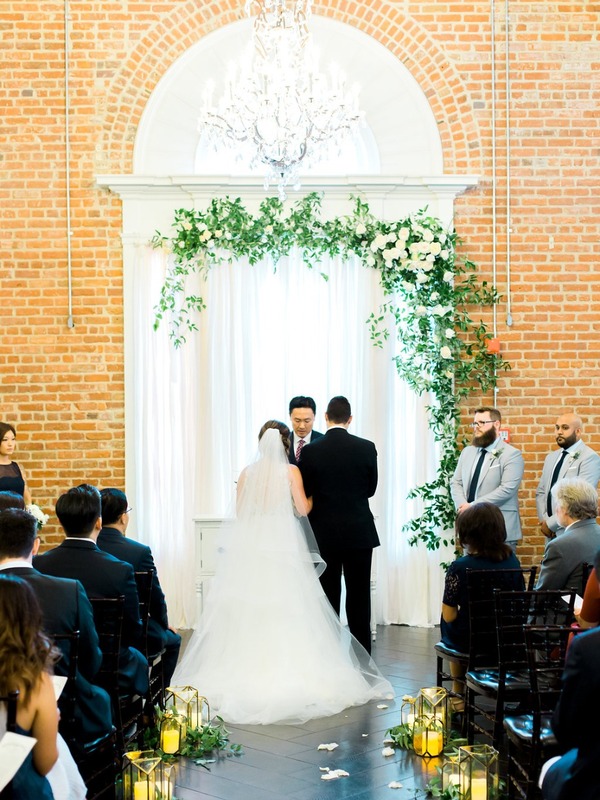 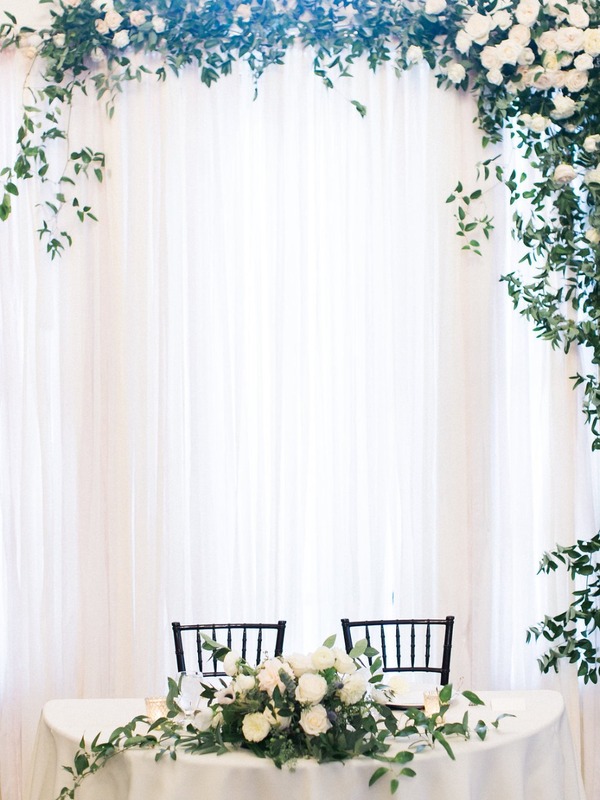 Lisa and Jeremy’s ceremony was held under a floral installation of trailing vines and lush roses set against the Estate’s arched windows, which later became the romantic backdrop for their sweetheart table. 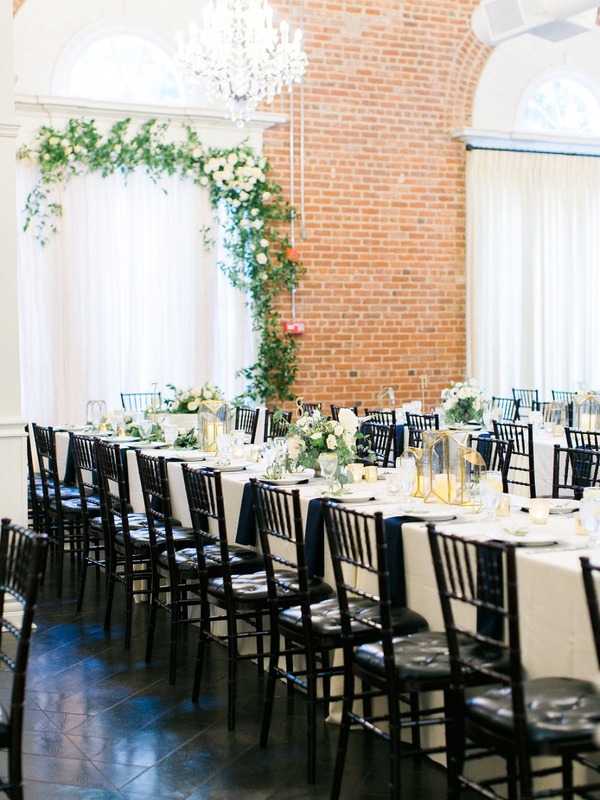 Guests dined at long banquet tables adorned with lush centerpieces and garlands, in the warm light of the candles and lanterns placed along the tables. 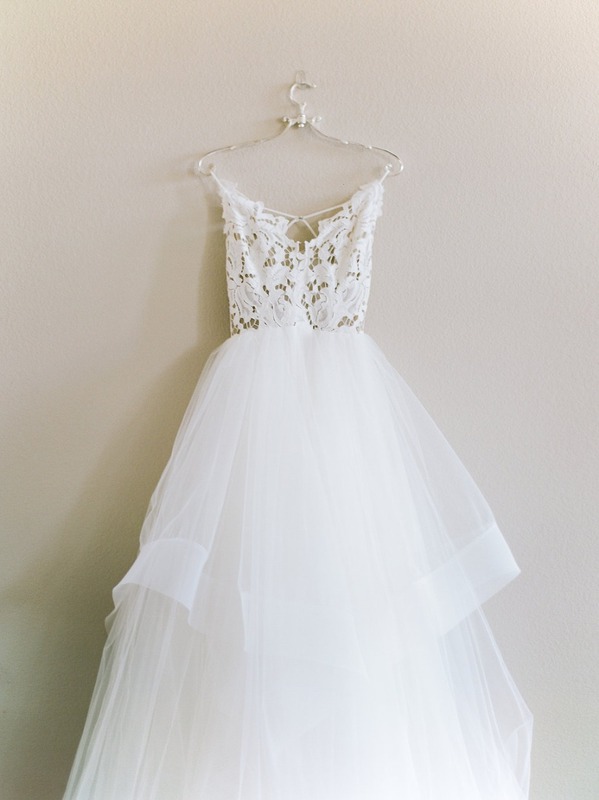 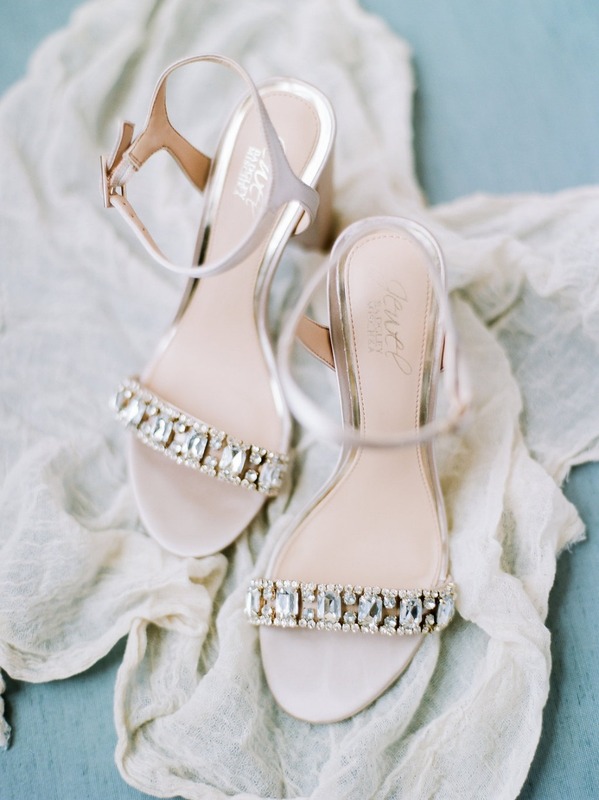 From the bride, Lisa: Jeremy and I both have an affinity for something classy yet unique. 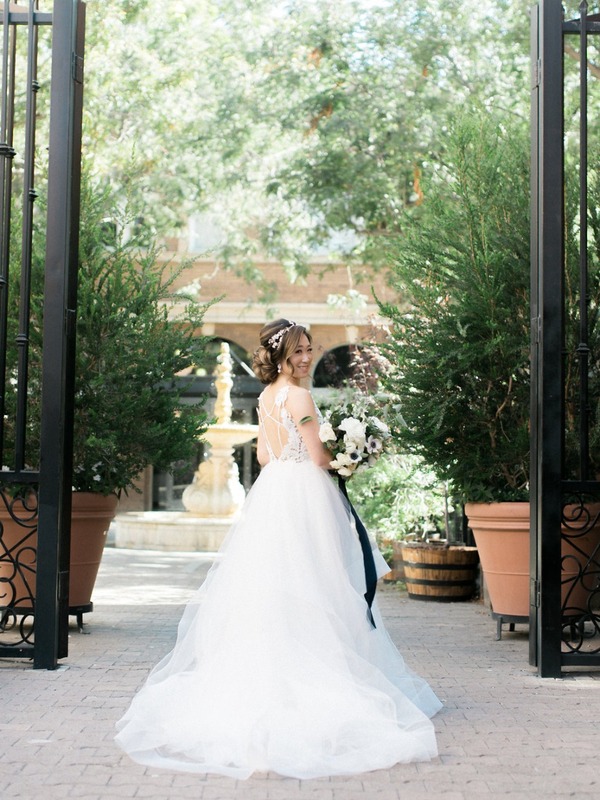 When we were searching for our wedding venue and visited The Estate on Second, we knew it was the perfect place for us. 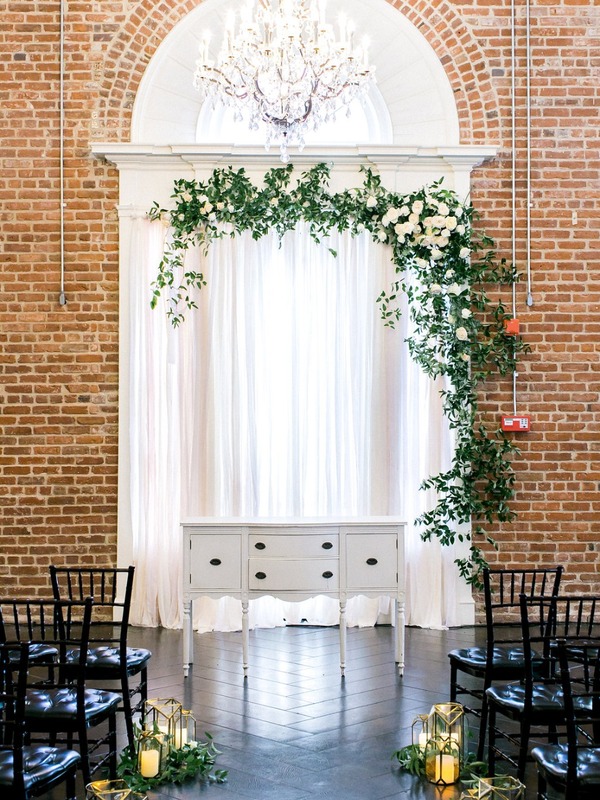 We loved the historic charm and elegant details it offers. 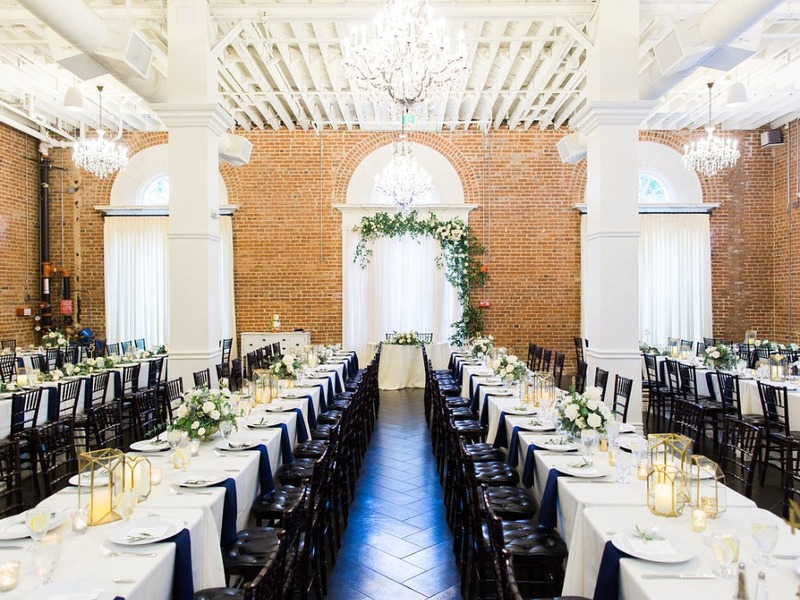 The brick walls, Palladian windows, and chandeliers took our breaths away and we knew our guests would love it, too. 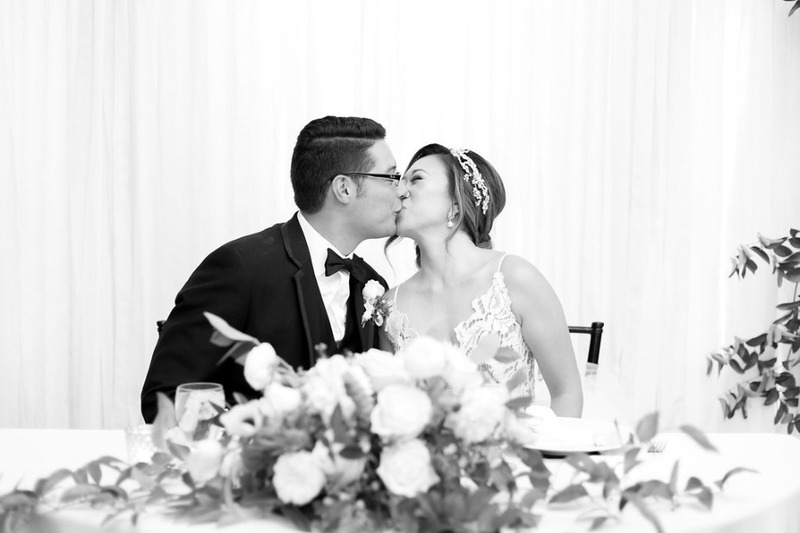 We wanted to make sure that our loved ones were a part of our special day, even if they couldn’t physically be there with us. 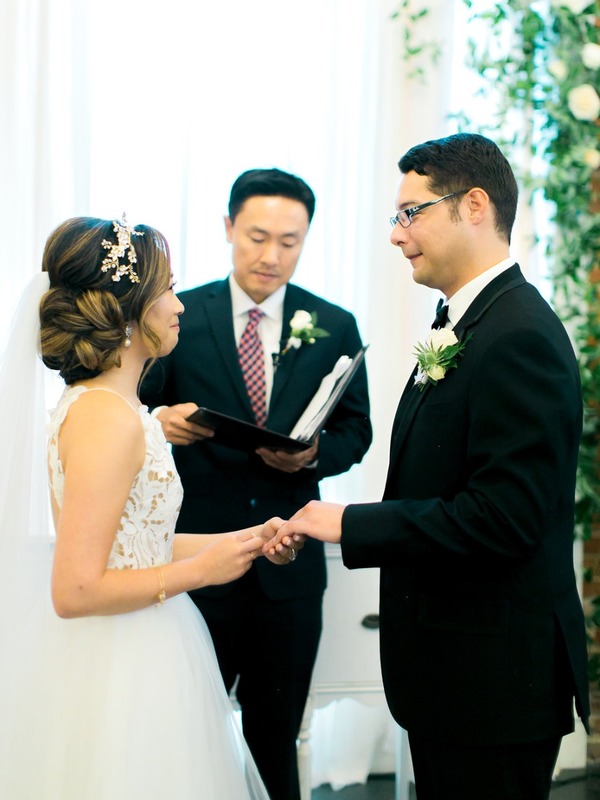 Having pictures of my grandparents and of Jeremy’s past brother during the ceremony made it that much more special for both of us. 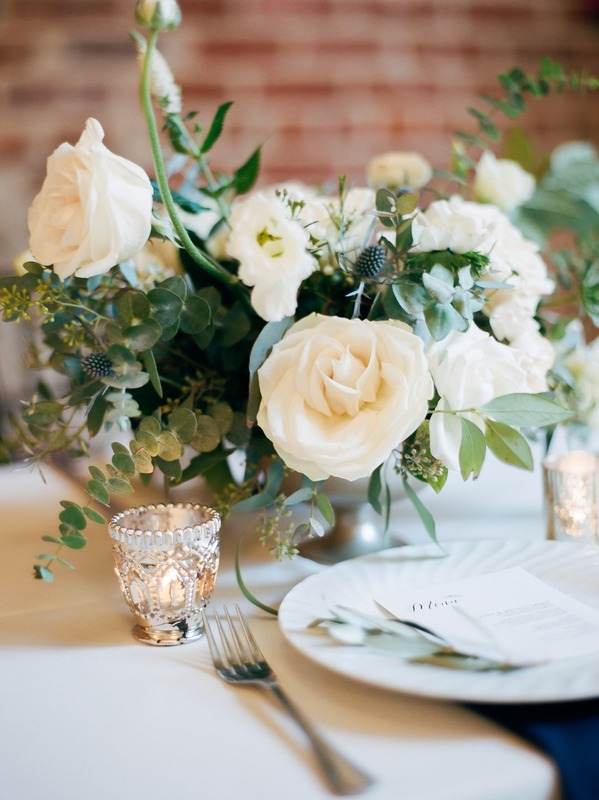 Our signature cocktail menu featuring our two rescue dogs, Aston and Daisy, added a special splash to our cocktail hour. 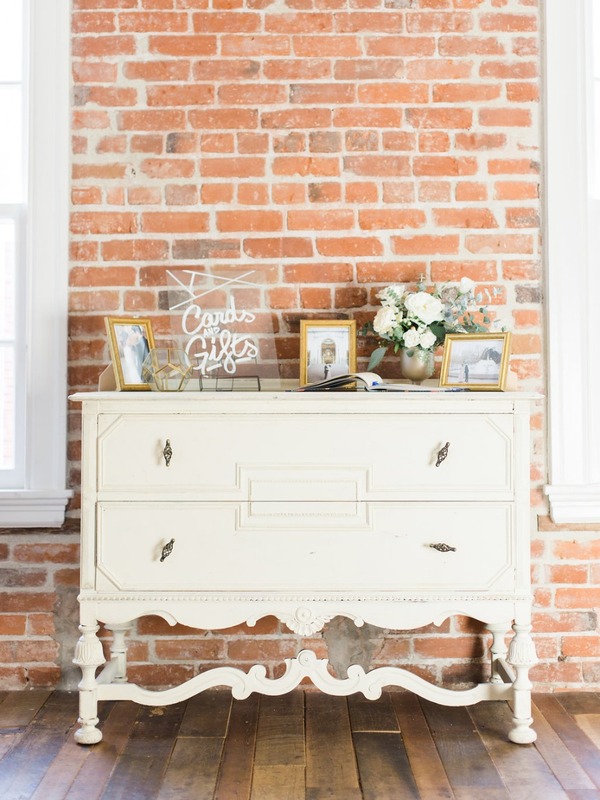 Paper Goods & Calligraphy Common Folk Paper Co.